Perform, the sports content producer and distributor, is a partner in WTA Media – a unique collaboration with the WTA created to centralise media rights and handle television production and distribution. Perform initially looked at building its own flypacks and hiring technical crew to handle host broadcast services, and also put out a tender for external OB companies to cover around 2500 live WTA matches per year. Ultimately, the company decided that working with NEP UK – with access to their expertise, resources, and talented staff – would be the best, most cost-effective and fastest solution. The timeframe from contract award to the first project was pretty tight. NEP’s Brian Clark and Donald Begg led NEP Group’s response to Perform’s requirements, and with NEP UK being busy building new trucks, Donald called upon the resources of NEP USA’s System Integration Facility in Pittsburgh, Pennsylvania to design a flypack solution that would be scalable, robust, and – being mindful of shipping costs – as light as practically possible. Members of the Perform team visited the facility in December 2016 to meet with the NEP Group team and finalise the configurations of the systems. The SI team pulled out all the stops to deliver the two main flypacks, named Jupiter and Saturn, on time, with Neptune - a third add-on system to allow a second court to be covered - coming a few weeks later. 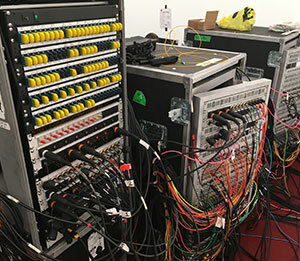 At the same time Donald worked with Simon Moorhead, NEP UK Broadcast Services MD, to recruit two Technical Project Managers (TPM) - Danny Ridler and Kristoffer Johansson - to manage the tour. There are 54 events or tournaments in total through the year, starting in China in January and ending around the end of October with the BNP Paribas WTA Finals, which are hosted in Singapore this year. NEP UK covers around 23-24 tournaments over 10 months. Danny and Kris manage everything for these events, including logistics, crew bookings, customs and technical requirements. “NEP UK excels at matching the right people to the right job and letting them move forward, trusting their expertise and experience,” Danny notes. The tour uses two dedicated flypacks – one in operation and one travelling to the next event. They have a basic spec of six Sony HDC-4300 cameras – which are 4K capable but the current remit is to shoot HD – plus Grass Valley Kula vision switchers, EVS XT3 servers, Calrec Brio audio consoles, and an array of ancillary equipment. Each flypack consists of 55 crates and weighs about 5 tonnes. Danny and Kris also alternate events, each leading a team consisting of a sound guarantee, a vision guarantee and two to three multi-skilled staff, depending on the size of the event. NEP’s solution has the flexibility and scalability to allow for additional camera operators and other technicians to be added as required for larger tournaments. Larger events such as the Singapore finals will require up to 17 cameras, additional replay machines and more ISOs and feeds to service the additional broadcasters that cover the bigger tournaments. NEP UK’s solution is founded on the flexibility to handle both the smaller tournaments and the larger tournaments seamlessly, no matter where they are. The first year went very smoothly, with a few challenges that the NEP UK team overcame with confidence. However, some things are beyond the team’s control, and NEP UK’s technical experts have to be ready for anything to ensure the broadcast happens smoothly. The partnership between Perform and NEP UK continues to be highly successful, and as Perform’s DAZN OTT live and on-demand sports platform grows, NEP UK is well positioned to deliver additional international sports coverage.